A lot of question raised to that is it possible to Control your PC with your Android. And No, we are not talking about Unified Remote or alternative to that. We are about to show you how you can control your PC as the way it is, with the same environment on your phone, so you will feel like you are using a mini version of your own PC. 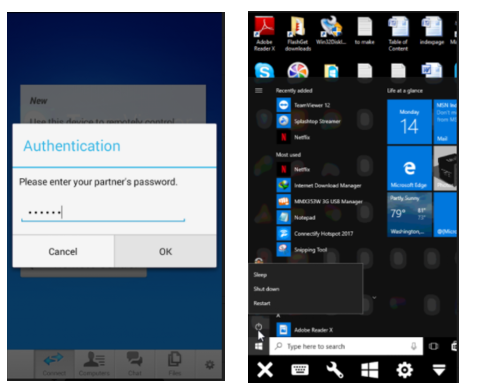 This process of using your PC on android can be done by using a remote desktop app/software. By this, you can control your own PC/laptop when you are in the room next to yours. We are going to explain you how to do it using a remote desktop app/software. 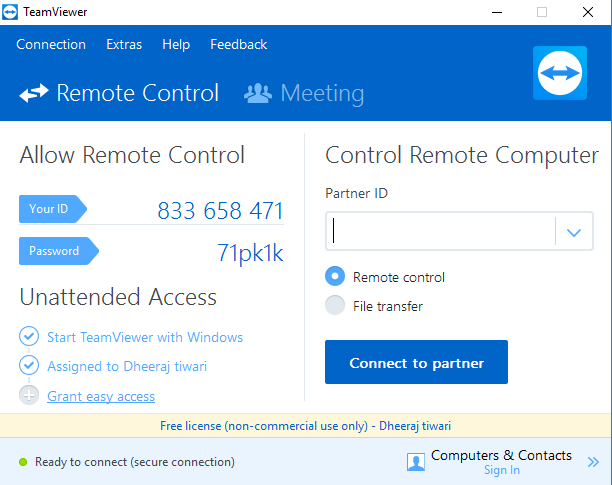 Teamviewer is the one of the best remote desktop software, which allows you to connect to your PC/laptop. You can remotely connect from your Android, iOS, Windows Phone or Blackberry to your desktop. If you talk about Operating System on your desktop then it works on Windows, MAC, and Linux as well. If you connect your Android device to your PC then you can access everything that you used to do on your PC. You can execute any file on your PC and even delete/edit them, Play videos/movies, play games etc. Access the internet on your PC if it has internet connection on. Open Teamviewer website and download Teamviewer software for your PC/laptop and App for your Phone and install them. After Finish installation on both sides, you need to register/signup on Teamviewer through Teamviewer software. It will provide you ID and password, Go to TeamViewer app on your android and put ID there. then it will ask you password, put that too and press ok.
Now you can see your PC screen on your Android device. Now, you can easily access your PC or your family and friends, you just need to enter their credentials on your Teamviewer android app. It is a paid software when you are connecting with your colleagues or clients for business purpose, means you need to pay if you are creating an account for commercial use. But if you are using it only for personal use then it is totally free for you. It has higher security and support, even it won’t ask any of your personal information. It’s just simple as it seems. No such complexity and easy to understand. Splashtop is recommended Remote Desktop software for Business and individuals. With the same amount of features to accessing your system through Android, this is very approachable one. To get started with Splashtop you need to go through almost same and easy registration process as TeamViewer. Highly Reliable to make a connection between your Android Device and Desktop. Excellent Security and all the remote session are encrypted with TLS and 256-bit AES. Also, can add two step verification for further security. Easy deploy via command-line or by sending a link. Available support for any information and solution. Take a Free trial and get started anytime. These above two Remote Desktop softwares are capable enough for accessing all the Desktop features using your Android Device.